Regina R. Brunelle, 98, of Manchester, passed away at Mt. Carmel Nursing Home on January 29, 2019 following a short period of declining health. She was born in Manchester on December 5, 1920, the daughter of Wilfrid and Aurore (Genest) Brunelle. She attended St. Anthony Elementary and High School. 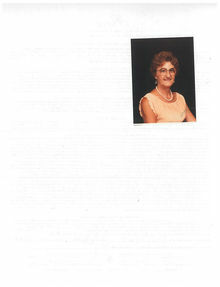 She was employed for ten years at Waumbec International Shoe and retired from Velcro USA after 28 years of service. She enjoyed dancing, singing, bingo, going to casinos, and walking everywhere. She had been a parishioner of St. Anthony of Padua Church and also St. Theresa Church where she assisted in preparing and serving memorial meals. Most recently she attended Blessed Sacrament Church. She was a member of the Daughters of Isabella and assisted her voting Ward for twenty years during election time. She also volunteered at CMC Gift Shop for ten years. Her most memorable place of residence during her life was Ramsey House where she resided for over thirty years. Her family would like to extend a big thank you to all those family members and friends who visited and prayed with her over the years.